Almost two months into maternity leave and Frances and I are finding a groove. I feed her in the morning before anyone else is up and we head downstairs where she sits in her funny little seat on the kitchen floor while I make tea and figure out what to lay out for Oliver’s breakfast. The rest of the day fluctuates between me wearing her in a carrier while she naps, taking walks around the neighborhood or playing during the brief window she’s awake. After dinner when I think back on what we did during the day, it’s hard to name specifics — yet somehow time ticks on all the same. Knowing that Frances is our last baby has helped me accept this dramatic slow down in pace more readily than I ever could with Oliver. That and the perspective that the pace picks up quickly enough and these slower days will be gone in a blink. I think if we’re honest though, between the sweet chest naps and burgeoning morning smiles, days with a newborn can feel monotonous and even downright difficult at times. While everyone will always tell you to nap when the baby naps, that can be hard for some of us. I know in my heart that’s good advice and I even hypocritically give that advice to others, but I tend to look around the house and notice what needs tackling before Oliver gets home from school. The first time around I wasn’t as good about this, but now I know how important it is to give yourself permission to consider all the (often really great) advice on parenting a newborn … and then consciously choose to ignore what doesn’t work for you or your baby. One tactic that’s helped me lately is devoting each week to just one task. So I’ll take something that would typically take me a few hours to complete and give myself a whole week. Last week, my goal was writing a blog post; the week before that was devoted to filling in Frances’ baby book. This way, I feel that sense of accomplishment that I thrive on, but in a really realistic and doable way that allows me to just relax and enjoy getting to know the small person Frances is becoming, too. In addition to devoting each week to one task or theme, I’ve been getting in the kitchen a bit more as well. It took us awhile to figure it out, but it seems Frances has developed a sensitivity to dairy, so sadly I’ve had to cut that out of my diet (WHY, FRANCES, WHY?!) and the one thing I’ve missed the most is a great chocolate chip cookie. 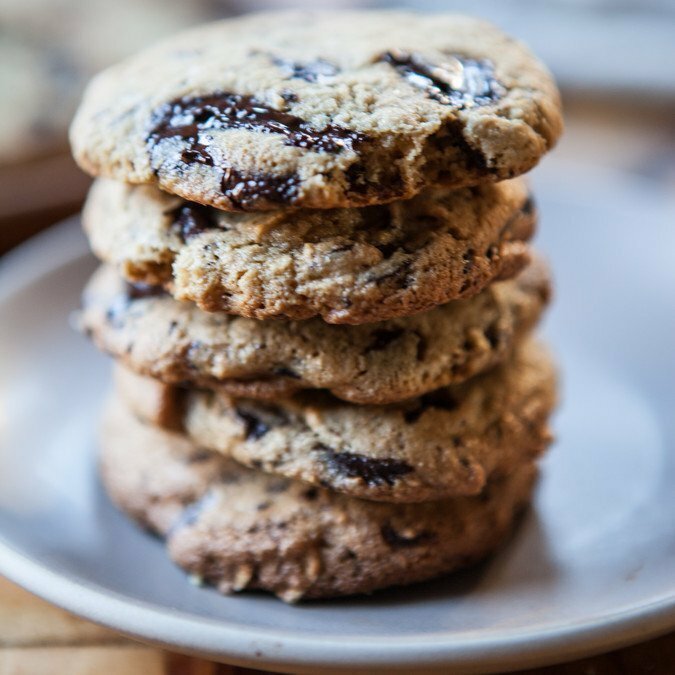 I did some casual polling on Instagram recently to see what everyone’s favorite dairy-free cookie recipes are and I was inundated with suggestions. WHERE TO BEGIN?! I made the Ovenly cookies people seems to love and they tasted great but the dough was really crumbly and finicky to work with. I made the recipe on the back of an almond meal package and found them kind of spongy but I loved the slightly nutty flavor and added protein. 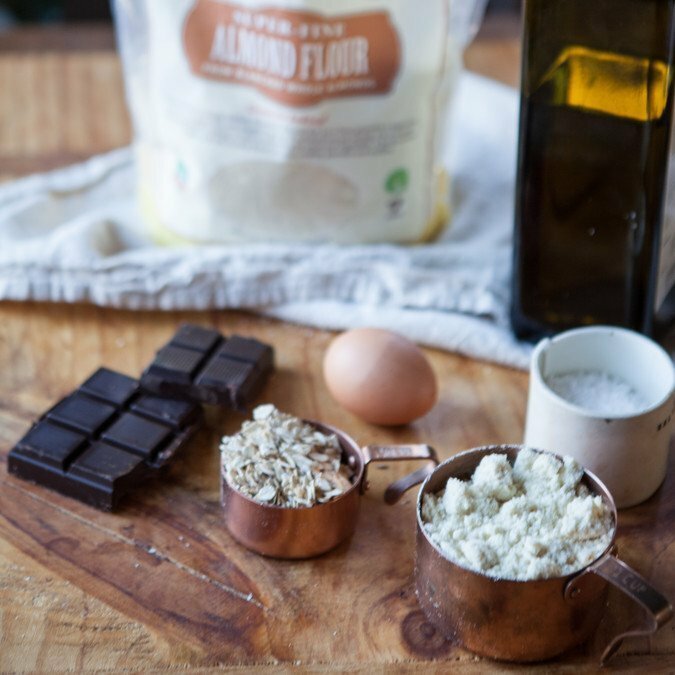 So I set out to create a dairy-free cookie made with almond meal that would have all the things I loved (and obviously none of the traits I didn’t). The result? 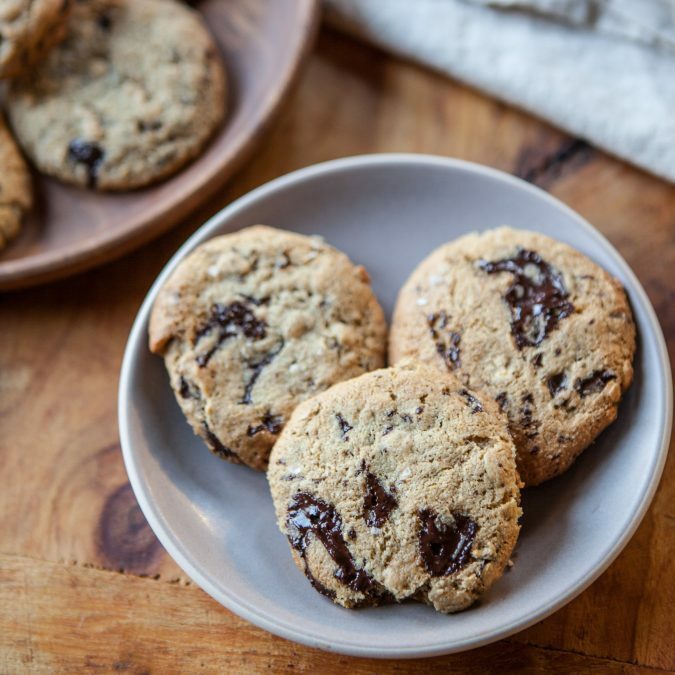 A chewy cookie with a killer nutty flavor packed with as much chocolate as I could reasonably fit, a handful of oats and a generous bit of brown sugar. They just so happen to be gluten-free as well. 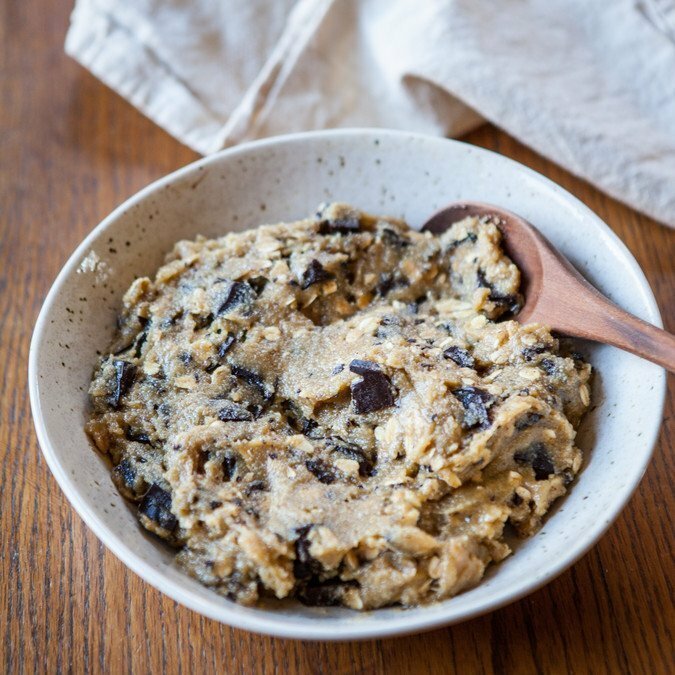 The dough is super simple to work with and they only require ONE BOWL, making them a great candidate to squeeze into the weekly schedule — whether yours is spacious with lots of free time to yourself or whether you’re working in tiny spurts around a sleeping baby’s schedule. Gluten free or not, dairy free or not, baby or not, this recipe goes to bat for all of us. I hope you love them as much as we do and if there are little thing you don’t love, tweak away! Because much like all the baby advice, you take what works for you and move forward, leaving the rest behind. Simple as that. This post is sponsored by Bob's Red Mill. As always, all opinions are my own. Thank you so much for supporting the brands that help me do what I love! I like to use bar chocolate in this recipe and chop it roughly (and not too small) so there are all different sizes of chunks throughout. If you need these cookies to be totally dairy-free, Trader Joe’s makes great “pound plus” bars that just so happen to be vegan. 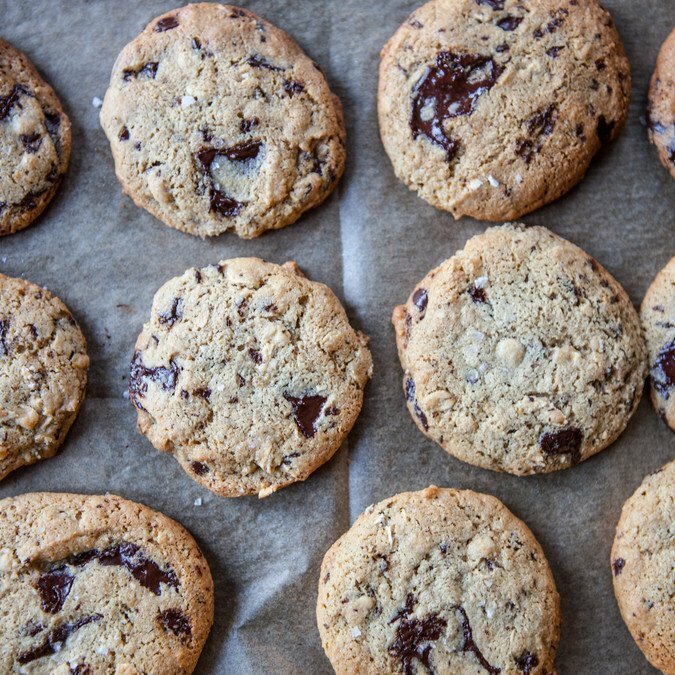 Be careful not to let the cookies get too brown around the edges — they’re really best just a little soft when pulled from the oven as they’ll continue to firm up as they cool. In a large bowl, combine the brown sugar, baking soda, salt, and oil, and mix until combined. The mixture will look like wet sand. Add the vanilla, egg, almond flour, and oats and stir well to combine. Fold in the chocolate chunks. Cover the bowl with plastic wrap and refrigerate for at least one hour and up to overnight. After the dough is chilled, preheat the oven to 350 F. Line a baking sheet with parchment paper or a silicone baking mat. Using a 1 tablespoon-size scoop (or a rough estimate of as much), scoop the dough onto the prepared baking sheet leaving 2 inches in between each cookie. Using the palm of your hand, gently flatten each cookies to about 1/2-inch thick and sprinkle with flake salt. Bake for 12 to 13 minutes, or until barely golden brown around the edges (the cookies will continue to firm up as they cool). Cool the cookies on the pan for 5 minutes, then transfer to a rack to finish cooling. These look amazing. It's always great to have different chocolate chip cookie options. These days I'm home with my younger child who is almost 3 and I still give myself just a few personal projects/tasks I want to accomplish and I'm usually running behind. I'll never be the mom who pushes to quickly reach her goals, but I'm still plugging away. Great, Susan! Yep, I think a flax egg would work just fine here. I hope you / they enjoy them! Do you mind me asking how you knew about her sensitivities? I’ve had tree children and they’ve never had sensitivity to anything but so many people do. Just wondering. I wanted to write in and tell you how much I love your blog. It’s my very favorite. It’s my go to for all baking. The recipes always come out delicious. Hi, Ashley! Of course. So when she was nursing she'd kind of writhe in pain - like she wasn't comfortable at all and she'd spit up much more and more violentally. So honestly I just tried giving up dairy to see if it'd make it better as I knew that was a common allergen and it's definitely helped. I think from a bit of research it sounds like if there's a severe allergy, they'd have blood in their stool (which she doesn't) so I do think it's more of a sensitivity, but she's definitely happier without it (can't say the same for me!). I’m on my 3rd kid and noticed a dairy sensitivity with my last two- difficulty with gas and poops, and had a couple diapers with blood before I really realized what was happening. On the advice of our pediatrician, I cut out diary. By the time they were 1, that sensitivity was gone and now both kids would live on cheese if I let them. I cut out dairy as soon as I gave birth 2 weeks ago to our newest little one. I’ll be trying these cookies as soon as I’ve got the energy! I love your posts even more now that you are sharing about your baby experience! Thank you so much for your lovely and open perspective. In other news, I am planning on being a contrary brat and subbing coconut sugar for the brown. I won't blame any ill effects on you! Oh thank you so much, Nanda. That's so nice to hear. And YES do it (re: coconut sugar)! Let me know how they turn out!! I do hope the sensitivity is just as her little body adjusts to life, but also know that it will be fine even if it is life-long. My 4 year old was diagnosed with celiac and as a home baker I was devastated. Now 3 years later we have so many gluten free baking adventures together and it's pushed me to learn new things. You're a talented cook and recipe developer. I'm sure your skill can handle the challenge be it short term or longer. ... and if I may ... as you know, I had Kelsey at 41 and have always referred to her as my gift. Savor every moment. Love you. Hi, Kathy! So glad you liked the cookies. I LOVE this recipe ... keep meaning to make another batch soon. Yes, you and Aunt V are my older mom inspiration :) Love you and miss you.